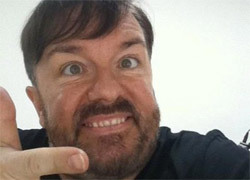 Ricky Gervais makes use of "mong"
What happened to word "mong" shows how the meaning of a slang phrase can ebb and flow. When I was at school in the 1980's the word was a general insult meaning stupid, ridiculous etc. But we knew it was a contraction of "mongoloid" - as people with Downs Syndrome used to be known. We knew the back-history. As time went by the word really did lose its original meaning and became, like words such as a Joey, Flid, etc, just another insult that could apply to anybody. Clearly others did not feel the same. When Ricky Gervais tweeted "goodnight mongs" he lit a controversy about who owns the word and what is means. For the younger generation - a big part of Gervais' audience - there was no bad intent. But he was challenged both by fellow comedians and disability rights campaigners. Gervais is a contraversialist - that's part of his act and part of his personality. His comedy springs from finding the very edges of what the general public will accept as tasteful. But no celebrity is going to want to be associated with disability-hate. I genuinely don't think Gervais has done this out of spite and malice towards those with Downs Syndrome. In fact he finds humour in society's hypocritical and tense attitudes towards the disabled. He has now backed down and retracted his use of the word mong. A salutory lesson in how a slang phrase can be offensive to some but completely benign to others. And a lesson in how the ownership of words can now be battled out and settled in the public realm via Twitter, blogs and newspapers. Slang words can change their meaning. Occasionally they can be changed back again. Use of Word 'Pleb' Could Cost Minister His JobWhat does the word 'pleb' mean - and why is it considered so offensive in Britain/UK?